Because I have a wonderful and supporting wife, I will be spending the weekend of April 10 and 11 in Grapevine at the DFW Writers' Conference. It's put on by a larger writers group in the Dallas area and, I'll admit, I am excited. They just recently posted a partial list of classes and there are several that interest me. I let Gina know a week or so ago about it and that I would like to attend. She said she'd do anything to support me in this whole writing thing, and if I thought this would be beneficial then she'd be OK with me going despite the cost. It's not cheap, at least not to us, but I think it will be good to get some actual instruction in the craft of writing and to get a chance to network with other writers, especially those who have been where I am and have found success. I don't know exactly what to expect, but I am excited. And I am grateful to have a wife who'll support my writing pursuit. Paying market versus non-paying market. There was a bit of a debate on some writerly websites on what writers should get paid for their work. I won't go into it in detail, but here is a link to a rather lengthy post with comments that gives you a good idea of both sides. If that really gets you going there's another post here with more. If you don't have the time or desire to read either/both of those I'll boil it down. One side says writers deserve to be paid a decent wage for their work. The other says, I'll take publication where I can get it -- even if that means getting paid nothing or next to nothing for their work. This is the internal debate I am dealing with right now. I am having trouble finding a market for the summer story. The one paying market I'd found didn't pay much but I liked what they published. A good mix of well-written stories. Well, I posted the other day that in the time I had decided on them and the time I was ready to send them my story they had closed to submissions. They don't have the money to pay writers right now so they were taking a hiatus until their financial situation could clear up. I respect that so I am not upset at them. It happens. So I started the search again, and I can't find a paying market for this story. I can find some non-paying markets that I like. I like the stories they publish. They are well-written and by authors that have multiple publishing credits. But in the end they don't pay. And I'd like to get paid. Gina talks about making our millions and that can't start by giving away my writing for free. On the other hand, and there is always an other hand, this story is one that I spent all of an hour on. The rewrites took about another hour total. It's only about 1,200 words long. It's not like I have a lot of time invested in this story. And it would be great to get a publishing credit. Of course, that assumes these free markets have an interest in my story. So that's my little internal debate right now. I'd appreciate advice anyone has. Welcome to the world, iPad. I have been thinking about the future of publishing seeing how the future of what I do for a living now and what I want to do for a living in the future is in the middle of a massive change. I am going to work up a post on that later. 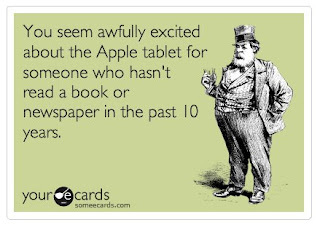 For now, though, I wanted to post this on the day Apple unveiled it's iPad. There are many who are saying it will revolutionize the publishing world. Honestly, I can see that. But it doesn't make this any less funny. I had done my research. I had found my markets. And tonight I was putting the polish on my cover letter for the summer story, getting ready to hit send on the email. I figured I'd check the submission guidelines one last time to make sure that I hadn't missed anything. Click through the links to get to the details and what do I find? So it's moving down the list to the next market, but it's frustrating. I was excited about finally getting this piece out and read. First an update on how yesterday went. One and a half out of three ain't bad. Made the final edit on the summer piece, so that's done. Did nothing with the story I found the other day. I also looked more into places to submit and may have found another one or two. So, since I didn't get the other piece edited or the markets finalized those goals are going to move to one and two for the weekend. And, because I like to do things in threes, I'll add one more. 3. Write. How is that for general? I have been so focused the last week or more on editing and submitting that I have barely written anything. Hope I can change that this weekend. I have a few things to do around the house but I think I can find a few minutes to squeeze out a few words. I am not going to be shooting for a certain number of words. I'll be happy with anything. I am going to try and make daily goals and post them here. Hoping that will keep me moving forward. Having them in a public place, even if not a lot of people see them, may help. So here are the goals for today. 1. Do the final-final edit on the short piece I wrote this summer. I did one more quick one on it last night and tweaked only a couple of things. That was edit four on the piece. I want to go through it one more time tonight just to make sure nothing jumps out at me. 2. Do an initial edit on the piece I came across the other day. I think I did an edit on it right after I wrote it, but it could still use some work. Reading it the other night I came across some places that were confusing and could use a bit of polish. 3. Finish the search for markets for the piece from this summer. After looking a little deeper at one of the markets I had identified, I am not sure it's going to work now. The piece I have doesn't quite fit with others they have published in the past. I may still submit to them because it's close, but it may not be at the top of my target list. I'll try and update this at the end of the day, hopefully checking all three things off this list. Tobias Buckell, who I link to on the right, has an interesting post on what's going to happen to all of the unsold books when Waldenbooks closes its stores at the end of the month. In short, tossed in the trash. Read the post, though, because it's an interesting look at how the publishing industry works. Read the comments too. Lots of smart people leave their two cents. And for those of you who don't speak Acronym, MMPB stands for mass-market paperback. Driving to work today it occurred to me how I need to write one of these stories I want to complete by July. It's a story that is best told in self-contained scenes, so I think I am going to do it as diary entries. The main character is a preacher and it's his diary we'll be following. I have been thinking a lot about him lately and getting a chance to write him excites me. He should be fun. And the story will be interesting coming from his point of view. It's not a story that would typically have a man of God telling it. At least I don't think it would. There could be a dozen of them out there collected in an anthology. Wouldn't surprise me since my research for places to submit stories has revealed there is an anthology for every possible theme. Here's where I need help. I know that a story told through a series of letters or diary entries has a name. What is it? I used to know this, but the answer is escaping me right now. Working tonight on some editing I took a minute to look at another older piece sitting on my hard drive. I think with just a bit of work it may be ready to go out for submissions. It's short, just under 1,000 words, so it fits nicely into the category of flash fiction that I am seeing most places (under 1,000 words). It's a piece that I finished years ago and it's written in the form of a letter to a former love. Not a love of mine, but of the main character. It's a story of the entire relationship told in brief paragraphs. I liked it when I wrote it. I like it now. I did submit it to a contest once on a whim but didn't win. That's OK. I think I can polish it up and then send it out. So, potentially I could have two pieces out for submission within the next week. I think I may have even found a market for this one. It's not a paying market and I don't like that. But, from what I can find in a quick search on the Internet the publication seems to be respected. I need to do some more searching to confirm those thoughts, but it's what I could find before hitting the sack tonight. Finished one edit tonight. I tightened some of the writing and it went form 1,500 words to a little over 1,200 words. I took out a big chunk in the middle that just didn't make sense in this story. It was a bit unbelievable and a little violent. It was one of those little bits of writing that seemed to come easy and hated dropping it. But knowing I could use it again made it somewhat easier. I have found a couple of places I think it could work. I need to do a little more research and read some of the pieces that they have accepted to make sure that my piece fits. One of the markets doesn't pay anything, but from the little I have read about it seems to be respected. A few of the stories they have published have been nominated for some awards. Plus the editor is a respected writer. So there is that. Another market pays semi-pro rates and that is as low as I want to go. That means it could be a range of one to five cents per word. So that's where I am now. Looking for markets and starting to edit the monster piece. I think that one is going to be a more difficult edit. I am ready for the challenge and kind of excited about the work ahead of me. Plus I want to finish writing one of those short stories by the end of the month. I know I gave myself a longer final deadline, but I also have some internal deadlines that I want to keep, and finishing one of the stories by end of the month is one of those. Went to the first writers' meeting in a few months today. A couple of others there said they had blogs and I let them know about mine. SO, if any of the other four members of the writers' group are here checking in, hello. I don't think this thing is as fledgling as I may have made it seem. Some interesting advice from the blog of writer William Jones. He is talking about the overuse of the word "that" in recent fiction. I will admit I am a frequent offender. You can read the rest of his post here, but this was that section that stuck out to me and something I am going to try in the current rewrites I am working on. I did a quick read on a piece that I wrote over the summer and made some preliminary edits. Found a couple of places where the story can tighten a bit, and a couple of places where I can make a few tweaks. Overall, I was happy with the story after being away from it since August. My biggest concern after I moved it to the "Ready for revisions" file was the ending. Even had someone else from my writers' group ready it and he said the ending left him a bit unsatisfied. Now, I am not so sure. I kind of like where it ended up. It feels a bit like we are walking away mid-conversation, but not in a bad way. I know that makes almost no sense, but I know what I mean. So, after I make a few tweaks I think it could be ready to send out. I have been researching markets and I think I have found one I'd like to submit to. I'd like to find more than one, but I ma having a tough time finding p;laces that want this kind of story. So, if anyone knows of a market looking for a short story in the 1,500 word range that involves heavy chains, brass knuckles and an exhibit hall let me know. And in keeping with my inability to focus on just one project at a time, I have started editing another piece. It's the first monster story I finished this summer. I am only a couple of pages in on the initial read, but it's pretty obvious where I can trim and tighten. There is a section right at the beginning where I introduce the main character that really needs some help. And I still struggle with a few of the "Why" questions I had earlier. I don't know that they need to be answered in the text of the story, but I'd like to know them for me. I think that would help in the future when I play in this world again. I have resisted doing this, but I can resist no longer. I need the list of things to shoot for in 2010, at least writing-related things to shoot for. Or for which to shoot if you are particular about that sort of grammar thing. Here is what I have come up with for now. This list isn't exhaustive and can be, and probably will be, updated. I am going to give myself a timetable so I don't just sit around until Dec. 15 then try to cram this all in. GOAL: Edit the three stories I completed in 2009 and submit them for publication. I've already started on this but don't like the way I am doing it. I am still trying to feel out my editing process. I don't think I like doing it on the screen. I may work better from the printed page. I'll have to figure this out as I go. GOAL: Finish the three works in progress that I have half-finished on my hard drive. They are three projects that I am excited about and think have potential. GOAL: Write another story in my monster-cops series. These center around a main character who still intrigues me and I think the idea is one that has some potential for several stories. I just need to figure out what those stories are. GOAL: Make progress on the novel. This is a vague goal, the kind you aren't supposed to make. They are supposed to be measurable, but completing the novel isn't as important to me as completing, editing and submitting the other things I have going. Still, I do want to complete it, more for me than anything else. I have a feeling that this is going to be one that just collects dust in a drawer, but that's OK. I am learning things when I work on it and I know my writing is improving because of it. GOAL: Dress up this blog. It needs to be more attractive. I know I shouldn't, but I judge blogs by their covers. If it looks good I'll spend more time there. I know, I'm shallow. But, if everything goes really well with my first goal I could have more readers stopping by. It's a bit of wishful thinking on my part, but I gotta stay positive. If they do come, then I want them to be impressed. So there you go. Those are my goals for 2010. These are very modest compared to other writers, I understand that. But, for me, I think these are appropriate and goals I can meet. I'll try and update these throughout the year, both for you and for me. I could probably use the accountability. Jeff Vandermeer, who I link to on the right, is writing a series of posts on technique. At the moment he is talking about openings and using his new novel Finch as the examples. He is talking about novel writing, but if you have any interest in writing at all you should read it. It can apply to anyone. I am testing out a new tool to post a bit that I came across that I liked a lot. Many times I find myself having characters notice things or say things they really shouldn't notice or say. The problem is one of two things. Either there is no way they should/could know what they are saying, or they shouldn't really notice what they are noticing. It is such a part of their everyday life that it should now go unnoticed. Anyway, Jeff says it better than I do. It is my feeling that landscape not invested with emotion or point of view is inert, lifeless. Like a historical novelist, when writing fantasy set in a place not here, I have an obligation to describe that place and make it realistic, but I have an equally important charge not to lard the narrative and the characters with excessive description or description that is not truly related to the viewpoint character. Which is to say that certain things are known to Finch and thus must be given over to the reader and other things that he knows but would not comment on or really register must be conveyed in a kind of shorthand, or conveyed in a context in which he would register them. That includes aspects of the setting, in addition to his interactions with other characters. This is short but really good. Very Twilight Zone and I had it figured out early on, but it was still fun to watch. Watch it quick, though, because it won't be online long according to the official site. If you've read me for any time at all, or ventured back into the archives, you know that I am fascinated with process. I love seeing how and where other people work. Stumbled across this video of cartoonist Mort Drucker, known mainly for his work in MAD magazine. Watch it if you'd like. I found it quite interesting. It's just a teaser to a longer video at schoolism.com. He talks about how he got started, how he works, shows us his studio. He talks about the importance of hands to a drawing. He also talks about drawing caricatures. Said that he needs to have a front shot and a profile shot of a person before he can draw a caricature, because if he has only one or the other then he can't know what the person really looks like. That got me thinking about my writing. I have tried in the past to do quick character sketches of people I wanted to write about. I wanted to get to know the full person. I don't always finish them, and often I don't even start them. I am too eager to get to the fleshing out of the idea. But after watching this video I wonder if my stories are suffering from thin characters. I mean, if the idea that I am trying to flesh out is mainly action, then all of the character I see is their profile as they run past me. If the idea I have is a little more heady then all I have is the character staring at me straight-on saying "Write my story." Either way, I don't know what the characters will be like when either they are forced into action or when they are forced to be still. I think I tried to stretch that comparison to the video a little too far, so I apologize if it doesn't make sense. I am doing this quickly.I think it does, but it came out of my head so it should make sense to me. Anyway, a new resolution. Fuller characters in 2010. Or paying more attention to try for fuller characters in 2010. Today is the last day of Gina's Christmas break. Actually, yesterday was the last day of her break. Today is just an extra day off since she went to an in-service during the summer. Today is her reward. We are planning on spending it doing things around the house. We also want to see a movie. Problem is we are getting a slow start. And have no idea what movies are even out there to see. I have a large mirror to hang and other pictures to get up on the walls. We are still trying to decorate this place. It's starting to feel more like home and we actually made a couple of furniture purchases yesterday. I spent my evening last night putting together a pair of bookcases that we bought for the library/formal living room. They are black and look pretty sharp. Easy to put together and once we have all of them that we want it's going to look really nice. We still need seating for it all to come together. Don't tell Gina, but when it's done I think it's going to be my favorite place to write. Gina just asked if I wanted to get two more bookcases today. I am game. We have a literal ton of books and need some lace to put them all. Speaking of writing, I added about 250 more words to the piece I posted the top of a few days ago. It's not perfect but it's not bad. The big thing, though, is it's writing. It's progress and that's better than just about every day since we bought the house. I'm happy.